I don't know that I need to say much about the following story and its accompanying video. Similar news stories concerning Lila Rose, editor of the UCLA Advocate--a pro-life publication, have been around for some time now. The story and video make it clear that Planned Parenthood's financial motivation is such that they welcome the support of anyone. However, my suspicion is that they don't really care which race gets aborted, but it is important to Planned Parenthood to further the idea that they are somehow helping the underprivileged. Naturally, no one is helped by abortion--especially the fetus--but it's part of the delusion of the pro-abortion culture to make a claim on behalf of individual justice and human rights. Unwanted pregnancies and abortions are facts of the times in which we live. It is not enough simply to be opposed to abortion. We must offer alternatives to it on a widespread and well-funded basis. My opinion is that alternatives to abortion and such efforts should be publicly funded as well. The realization of the sacred nature of life is a gift from God, an awakening in the conscience of being made in the image of the creator. However, we can help things along through education and media productions--both in print and televised. I know the influences and scope of Madison Avenue, and I've always thought that Catholicism has fallen behind on using televised media. I feel strongly that Mormonism has made gains due to advertising. Why not advertise Catholic values in the same way? Part of the realization of the kingdom of God is making the world a holy place through the power of the Spirit, through Christ, through him by whom we can do all things. In doing this we must be prepared to use the world to accomplish our goals. Is Planned Parenthood racist? I don't know--could be. Are they greedy? Undoubtedly. Los Angeles, Feb 28, 2008 / 08:07 pm (CNA).- The Advocate, a student magazine at UCLA, has released phone recordings of Planned Parenthood fundraising staffers approving of a donor who claimed he wanted his money to help "lower the number of black people." The magazine conducted a seven-state investigation to discover how Planned Parenthood fundraising centers would respond to a caller who expressed explicitly racist motives. An actor posing as a racist donor called Planned Parenthood development centers asking that his donations be used to abort African-American babies to "lower the number of black people." Each branch agreed to process the racially earmarked donation. None expressed concern about the racist motives for the donation, and some staffers encouraged the racist reasoning. SAN ANTONIO — Senator John McCain got support on Wednesday from an important corner of evangelical Texas when the pastor of a San Antonio mega-church, Rev. John C. Hagee, endorsed Mr. McCain for president. Mr. Hagee, who argues that the United States must join Israel in a preemptive, biblically prophesized military strike against Iran that will lead to the second coming of Christ, praised Mr. McCain for his pro-Israel views. Mr. Hagee, the pastor of the Cornerstone Church, said that his support for Israel had nothing to do with prophetic scenarios, but rather because he felt the cause was just. “They are a democracy in the Middle East that deserves the support of America and Christian people everywhere,'’ Mr. Hagee said. The talk about the preemptive, biblically prophesized, strike against Iran may seem strange, but it's my impression that what we're hearing is standard evangelical fare. I decided some time in the past that having a faith grounded in an obsession with prophecy is by far less than mature faith. It's the kind of thing that appeals to 19-year-olds who are bored with sci-fi novels. Nevertheless, it's popular and tends to sell books in the Christian fiction genre. As a Christian, I have a great deal of difficulty accepting a pro-war stance from those who call themselves by the same name. The message of Christ--rather than supporting a fear-fueled war--is one of peace, reconciliation, and forgiveness of one's enemies. What the world is in desperate need of is a little sanity. Especially it is the case that sanity about the future should be in high demand. True faith is all about healing, reconciliation, and building the kingdom of God. Evidently evangelical endorsements--of almost any kind--are the big demand in the McCain camp. The Internal Revenue Service is investigating the United Church of Christ, saying the denomination may have threatened its tax-free status by allowing Sen. Barack Obama to speak before thousands of members at a church conference in June. A lawyer for the church denied that the denomination, or Sen. Obama, who is a UCC member, engaged in any political activity when he and others spoke before an audience of 10,000 at the church's 50th anniversary celebration in Hartford, Conn.
A spokesman for the Obama campaign, Tommy Vietor, said the candidate "spoke to his church's convention about his personal spiritual journey....This was not a campaign event." It is considered unusual for the federal agency to investigate an entire denomination. The agency has previously investigated individual churches and ministers who have made comments about politicians from the pulpit. In rare cases, churches have been fined or have lost their tax-free status. An IRS spokeswoman wouldn't comment on the inquiry, which the church disclosed by releasing a letter from the agency. The 1.2 million-member religious body, which was formed with the merger of several Protestant groups, is considered a social-activist denomination. Federal tax law prohibits nonprofits from engaging in political campaigns. During an election year it is hard to say what is, and what isn't, a campaign event. I'll leave it to the lawyers to sort it out, but the facts are a little telling: Obama draws a crowd of 10,000--to hear about his personal spiritual journey. It is indeed amazing to learn that Obama's spiritual journey has the power to rival attendance at a Billy Graham Crusade. Years back when I did interreligious work I visited a local UCC congregation. I recall the minister asking me about my personal affiliation. Upon learning that I was Catholic he was quick to share his liberal political views--I even got the feeling that I was being tested. Undoubtedly, religion and politics have plenty to do with one another; however, a parish or congregation needs to beware when inviting politicians to share their spiritual journey. I wonder what other candidates have spoken to religious congregations this election year? Many U.S. Roman Catholics and Protestants are leaving the churches of their childhood and either choosing other faiths or no religion at all, according to an extensive survey released Monday. More than a quarter, or 28 percent, of American adults said they have left the faith in which they were raised, according to the Pew Forum on Religion & Public Life. About 16 percent of Americans say they are not members of any religious group, making the "unaffiliated" group the fourth largest religious tradition in the United States, rivaling the number of members in mainline Protestant churches. The three largest religious traditions are Protestant evangelicals at 26 percent, Catholics at 24 percent and mainline Protestants at 18 percent. The Catholic Church has lost more members than any other religious group, the survey found, with about 10 percent of all Americans reporting they have left. Those losses, however, largely have been replaced by Catholic immigrants entering the country, Pew researchers said. As a result, the total percentage of the U.S. population that identifies as Catholic has remained fairly stable. In a shift that could significantly alter the nation's religious fabric, the study also found a sharp decline in American Protestantism—that "the United States is on the verge of becoming a minority Protestant country." The number of Americans who report they are members of Protestant denominations now stands at barely 51 percent. Moreover, that population is diverse and fragmented, encompassing hundreds of denominations. The three largest groups are evangelical churches, mainline churches and historically black Protestant churches. "If these patterns persist, we are seeing that America is becoming a less Protestant and less Christian nation," said John Green, senior fellow with the Pew forum. •The Midwest most closely resembles the religious makeup of the overall population. The South has the heaviest concentration of evangelical Protestants. The Northeast has the most Catholics, and the West has the largest proportion of unaffiliated people, including atheists and agnostics. •Mormons and Muslims are the groups with the largest families; more than one in five Mormon adults and 15 percent of Muslim adults in the U.S. have three or more children living at home. •Of all the major racial and ethnic groups in the United States, black Americans are the most likely to report a formal religious affiliation. Even among unaffiliated blacks, three in four belong to a "religious unaffiliated" category—they say religion is either somewhat or very important in their lives. Slightly more than one-third of the unaffiliated population overall is in that category. •Hinduism exhibits the highest overall retention rate with 84 percent of adults who were raised as Hindus saying they were still Hindu. Findings in the report came from a national survey of 35,000 adults conducted from May 8 to Aug. 13, 2007. This comes as no real surprise. I have often heard that one of the largest religious groups in the US is inactive Catholics. Nevertheless, I still question the validity of a survey--even if it was taken from a sample of 35,000, there could still be a hidden bias. The information on Hinduism is interesting given that I just paid a visit to a Hindu temple. Also interesting is the information on Mormons and Muslims having the largest families. I easily recall the association of large families with Catholicism. Undoubtedly we are living in times when faith and religion are competing more than ever with a world view that has little room for God. It is ironic to see large numbers of people turn from truth and even embrace what seems to have more in common with fantasy than with sound doctrine. What we are given in our times is an even more urgent call--a responsibility and duty--to proclaim the truth of our faith. Ours is a world whose ailment is such that it does not recognize the need for a physician. It is as if we have been deceived into believing that all is well while a disease is busy taking its toll. I recall--years back--hearing preachers say that a falling away would come before the Lord's return. They were referring to 2 Thessalonians 2: 1-3, which states that an apostasy or rebellion would come. Of course since the beginning of Church history there have been numerous apostasies, rebellions and instances of falling away. Even with the potential negativity that abounds with such as report, we must not in any way despair. Faith is strong and the fact is that the times are ripe for great growth. At least in my part of the world we are seeing a great increase in the size of our parishes, and it's not all immigration either. I have noticed over the years that each year our RCIA group tends to grow. This year is no different. In many ways growth and retention of members is all about what we are willing to do as parishes to invite and keep people where they are. Our consumer society has become accustomed to a professional sell, and thus more and more we must offer religion that is noble, dignified, and anything but amateur in feeling or in presentation. I'm adding a link here to the Pew Forum's actual survey. Beware, it is a 143 page PDF, still it's worth spending some time with it. Also, you can link directly to the Pew Forum here and then click on surveys in the left hand column under publications. It's part of the proverbial "brag" of Texas to lay claim on "big." I suppose that when then the practice of temple Hinduism decided to make a home for itself in these parts they figured they needed something rather spectacular. One does not expect to find a temple spire out of India rising above the live oaks of the hill country. When I moved to the Austin area 14 years ago, I must admit that I was surprised to find Barsana Dham on a drive south of Austin while searching for the famed Salt Lick Bar-B-Que. Whether you pick up the aroma of curry or mesquite depends on which direction the wind is blowing. This past Sunday afternoon I decided to do something special for the blog and take a couple photos at Barsana Dham. On past occasions I have entered the temple--especially when I did interreligious work--but I was more interested in taking outdoor photos yesterday, besides I learned that they do not allow photos inside the temple at any time. I have always found Barsana Dham to be a peaceful and meditative place to visit, so I had to reassure my 13 year-old son that no one would shoot me for taking pictures; however, this is Texas. I feel that a good way to teach my children that what we have in our faith is beautiful and special is to allow them to see what is also beautiful and special about faiths other than their own. It's part of my way of living to be open to--and certainly tolerant of--the religion of others. While Barsana Dham is undoubtedly a lovely and tranquil place to visit, its outward appearance is no comparison to the great truths of the Catholic faith. While visiting yesterday the thoughts of my own parish--with its contemporary beauty was fresh on my mind. Also, I thought of the Cathedral in Austin where I prefer to go for the Sacrament of Penance--of course this gives me ideas for a future photo essay. 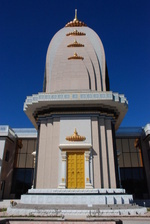 It is my understanding that Barsana Dham serves the Hindustani population in Austin. Certainly they picked a location that reveals the handiwork of creation. While visiting I have never had anyone ask me if I am a Hindu; however, if I were asked I would not mind at all sharing the joys of my faith in Jesus Christ as practiced in his Church. Being open to visiting the holy places of other faith affords us the opportunity to be the ambassadors of our own faith. A key element of evangelization is to carry the gospel to places where it might not ordinarily be expected. On this Feast of the Chair of the Apostle Peter, I recollect my coming to the Church as a convert and the reason I gave at my initial interview with the Dominican sister who ran the RCIA formation at my parish. Of course there were many reasons, actually many more than I will write about today; however, the one reason that stood out—at least at the interview, and I never forgot it and never will—was that the Church represented for me a rock amid a world where there was little upon which we could always depend. The Lord told Peter, "You are rock and upon this rock I will build my Church, and the gates of hell shall not prevail against it." In our times it does us good to pause with such a passage of holy words. They have the power to inspire faith. They are living words which, like fresh air, breathe life into our existence. As dark clouds loom overhead we, like the ancient Hebrews in the desert of Sinai, have abundant murmuring in the times of our lives. "The Church has changed," they say—"it troubles us that the Almighty has not preserved our rock foundation!" Yet faith says otherwise, indeed faith points to the rock stability that takes more than eyes of flesh to see. Faith points to the stability that lasts beyond our brief number of days. I look to a rock. I look to the Chair of Peter and to the unity among Christians that it represents. The authority on which our Church stands firm is truly a gift, and truly it is the envy of the powers of destruction. For in the Chair of Peter—in the gift of authority—is the only real hope for unity. It was a mere 18 years ago that I sat in the den and makeshift office of Sister Elizabeth's house across the street from the parish where I made my profession of faith. She asked, "So what attracts you to the Catholic Church?" I wasn't exactly sure how to answer. Not everything I felt seemed ready for expression in words. The truth is that something had stirred deeply in my soul since I was a child. For the longest time I had waited for the spiritual invitation to become a part of the Body of Christ. Thus, I was ready to leap into the welcoming arms of the Church as if to embrace a long-lost love. I had no trouble calling to mind what Jesus told Peter. The image of the rock was clear. It took many years to unfold the nuances of meaning and the implications—the realities—of the rock. They're still unfolding as I struggle to find just the right words with every passing hour. Suffice it to say that in the storms our times we need to trust more than ever, and indeed we trust in that which has a sure foundation. Indeed we have a sure authority, a certain gift, on which we may always depend. Aref Ali Nayed, a Libyan scholar in the delegation, said the summit would confirm arrangements for an audience with the Pope. "He is not just a religious leader, he is a theologian and scholar and we will meet him on those terms," he said. Nayed will meet Cardinal Jean-Louis Tauran, president of the Pontifical Council for Interreligious Dialogue, a body dedicated to improving relations with Muslims. The two clashed recently after the cardinal said that real theological debate with Muslims was difficult as they saw the Qur'an as the literal word of God and would not discuss it in depth. At the time Nayed said the comment was "disappointing". He was, however, more optimistic about the Vatican trip, saying: "We will go there with hope and an open mind." Interestingly, since the Note on Evangelization came out, we're seeing more stories like this one. I will be interested in following this to see its outcome. I am also intrigued with the assertion that theological debate of any depth is difficult with Muslims on account of their seeing the Qur'an as the literal word of God. It's kind of like debating with Christian fundamentalists I suppose. Also intriguing is that Nayed says he will go to the Vatican with an open mind. not if you ask either one of them. As a season of penance Lent gives us a time of year to consider the ever-present need to turn away from sin and to turn to God. Before I became a Catholic I wasn't accustomed to thinking of "penance." The idea of living a penitential lifestyle wasn't something that I considered. I recall, during the Lent that led up to my reception in the Church, even being rebuked by a close Evangelical friend for suggesting the idea of living a life of penance. Although penance wasn't part of my way of talking before I was Catholic, the idea of repentance was something that I had grown acquainted with as a Pentecostal. In order to deal with one's sins it was necessary to repent of them. To repent, as I understood it, involved a permanent—at least in intention—turn from that which stood in the way of my relationship with God. I still believe in repenting as a way of growing closer to God. Lent is a season to learn how to repent perfectly. True contrition always leads to conversion, to turning away from sin and toward God. I have come to believe that when our faith makes us ready God prepares our hearts for a more meaningful celebration of the Sacrament of Penance by inviting us to repent thoroughly. The Act of Contrition itself bears much more meaning when it is spoken with the heart. Often I have wondered what perfect contrition would look like; however, I may have thought of it more of saying—or praying—the right words. Now it seems rather clear that perfect contrition is born of the decision, or even the desire in the beginning, to leave sin behind permanently. Penance is the kind of thing that we receive in a moment of true clarity when we suddenly become aware and realize that it has been in our power all along to resist temptation. Our actions speak to God. Here I'm talking about our attitude toward ourselves, especially in making the admission of our need for God's help when it comes to sin. We say yes to God's grace when we acknowledge our weakness, and when we say with our deeds "I am not worthy to receive you, but only say the word and I shall be healed." How often have we received Holy Communion when we should have received Penance first? The battle against sin is not one fought alone. Frequent reception of the Sacrament of Penance not only heals us but it fortifies us to avoid that which wounds our relationship with God. We have received the way of penance: prayer, fasting, and alms work to sanctify us and strengthen us. Prayer summons more powers of help than we might possibly imagine. Living a lifestyle of penance is taking up our cross, not only seasonally but perpetually. Repentance clears the way for relationship with Holy Spirit, for having in us the mind of Christ. We come to know Jesus by becoming a friend to him. It is a matter of making a willful choice to serve the Lord.